Habit: Shrub, tree [woody vine]; nectaries often on stem, leaf, calyx, ovary. Leaf: generally 1--3-pinnate or -palmate (or simple), generally opposite or whorled. 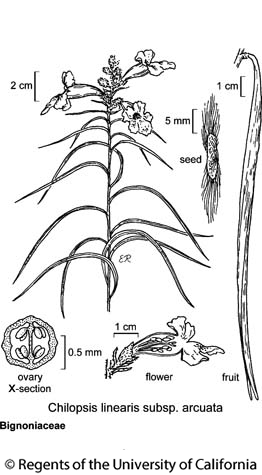 Flower: bisexual, showy; calyx generally 5-lobed, 2-lipped or not; corolla funnel- or bell-shaped, 5-lobed, generally 2-lipped; stamens epipetalous, generally 4, paired, a 5th vestigial (a staminode) [or 0]; ovary superior, chambers generally 2, placentas 4, axile (or chamber 1, placentas 2--4, parietal), style long, stigma 2-lobed. Fruit: generally capsule, long, cylindric to +- round, sometimes flat, 2-valved. Seed: many, flat, generally winged. Genera In Family: 81 genera, 827 species: generally tropics, especially South America; many ornamental (Campsis, trumpet creeper; Catalpa; Jacaranda). Habit: Shrub, 1.5--7 m, willow-like; deciduous. Leaf: simple, generally alternate (often some opposite to whorled on same pl); blade 10--26 cm, linear, curved. Inflorescence: panicle or raceme, terminal. Flower: calyx 8--14 mm, inflated, 2-lipped, generally soft-hairy, +- purple; corolla 2--5 cm, fragrant, white or light pink to lavender with yellow and purple markings in throat, lobes spreading, margins jagged, wavy; stamens included, anther sacs 2; staminode included, glabrous. Fruit: < 35 cm, linear, not flat. Seed: 6--12 mm, oblong; both ends long-hairy. Chromosomes: 2n=40. Citation for this treatment: Lúcia G. Lohmann 2012, Chilopsis linearis subsp. arcuata, in Jepson Flora Project (eds.) Jepson eFlora, http://ucjeps.berkeley.edu/eflora/eflora_display.php?tid=49857, accessed on April 24, 2019. SCo, e TR, e PR, D; Markers link to CCH specimen records. Yellow markers indicate records that may provide evidence for eFlora range revision or may have georeferencing or identification issues. Purple markers indicate specimens collected from a garden, greenhouse, or other non-wild location.